Sorry for the very long delay guys, but I have been extremely busy and have been unable to write up a tutorial or work on this until today. Anyway here is what you need to do to get Umineko working on your device. These steps are quite brief, if you are not sure about how to do something, try checking out my Tsukihime tutorial from a while back (it’s quite detailed and similar). 1. Create a new folder called “Umineko” somewhere on your computer. Copy every single file from your Umineko installation folder (excluding the .dlls, .exes and the Witch-Hunt patch folder) into it. 2. For all the arc.sar files (i.e. arc.nsa, arc1.nsa …), rename them so that all the numbers after the arc name is incremented by 1. That is, arc.nsa -> arc1.nsa, arc1.nsa -> arc2.nsa etc. 3. Now paste the contents of the patch folder into the Umineko folder, the arc.nsa file should not get overwritten since we have renamed them. Replace path_to/Umineko/arc.nsa and arc.nsa with the appropriate values. What this does is converts the original arc.nsa inside the Umineko folder we have and creates a new arc.nsa archive in our current folder (ie the folder with nsaconv.exe). After you’ve converted them all, cut and paste the new converted archives and replace the old ones into the Umineko folder. 5. Copy the Umineko folder onto your iDevice, so that its path is “/User/Media/ons/Umineko”. 6. Now copy the Umineko.app folder from umineko-iphone.zip into /Applications/Umineko.app. 7. Chmod /Applications/Umineko.app/onscripter to 755. Chmod the entire folder recursively “/User/Media/ons/Umineko” to 777. 8. Respring, look for the new Umineko icon, and play. You can follow this tutorial for EP6 too, although you’ll have to change around stuff in the Umineko.app folder and rename things to like UminekoEP6.app etc. If you encounter any problems, just post a comment below and I’ll do my best to help you. As I was writing this I was also doing the steps myself to ensure that everything works. If you encounter any graphic problems that are the result of the nsa converter, or if you find the quality of the converted images to be too low, you can use “nsaconv 640 422 path_to/Umineko/arc.nsa arc.nsa” instead, although this adds quite a bit of size. There is a problem with one of the BGM filenames (ロウソクたちが踊る.ogg) that causes the game to crash. To get around this, rename it to something like BGM1.ogg. After this you’ll have to extract 0.txt from nscript.dat using nscdec (from ONScripter Tools), and replace all instances of that filename with BGM1.ogg. 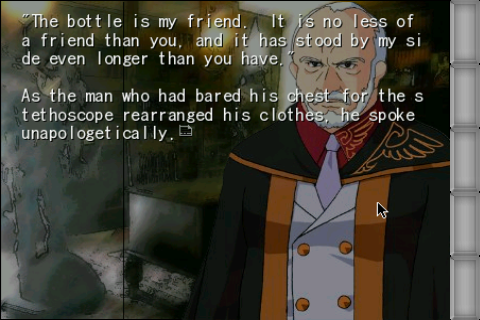 Copy 0.txt into User/media/ons/Umineko and delete the old nscript.dat (make a backup somewhere though). I’m not sure if there are any more filenames that cause this problem, but you can do the same thing for them (and I don’t think it is all Japanese filenames, just some). Update: “犯行の予告状読み上げ（ラック眼力）.ogg” also causes the game to crash. Quick question, what’s the best way to copy some of the music files over to my iPod? When I copy the Japanese titled tracks over WinSCP, it says it can’t find the file because its replacing all the characters with ????s. Get iFunBox, it’s faster and better than Winscp (it connects through USB). Just for some input, it looks like some of the more special kanji are at the root of the problem. I don’t have too much Japanese experience, but it looks like ロ and 上げ could be a little less standard, causing issues. I wouldn’t take my word for it, though. Looks like I got a bit of a problem when I tried to do it. After finishing all the steps, including CHMODing with mobile terminal, I restarted and attempted to run the Umineko app. The app tries to open, with the growing black screen that happens whenever you open an app, but it immediately closes. Nothing actually opens, the launch simply stops and I am sent back to the springboard. Do you have any idea what could be causing this? Mine does this too for EP 6. My EP 1-4 works perfectly fine, but EP 6 is giving me some hassle. Have you changed your SDLAppParam.plist and Info.plist in UminekoEP6.app? I did that, I have EP6 in a folder /var/mobile/Media/ons/UminekoEP6 while 1-4 is just plain Umineko. If they’re the same name for the identifier, one of the two doesn’t show (since they’re the same thing then). I’m running this on an iPod Touch 2G with OS 3.1.3. This is very strange… EP6 works fine for me. Before it crashes, do you see the buttons on the side? Or is the screen completely black? Just black for a split-second, no buttons. Then it just returns to the page where the button was pressed. I have the ons set up with the converted arcs numbered correctly, default.ttf, nscript.dat, BGM, BGM0 & BGM2, ME, movie, SE, and sys_se. Ok that probably means that the OS isn’t allowing the onscripter program to run, not because of your converted files. Are you sure you’ve chmod’ed the onscripter binary in UminekoEP6.app to 755? It should work if your Umineko EP1-4 works… If still doesn’t work chmod all the files in that directory. …That’s what it was. I CHMODed the folder, and the files inside were still 644. Now it works! How do I skip the OP in episodes so the scripter doesn’t crash? The OPs crash your game? I’m pretty sure I’ve edited out all the parts in the source code that involve video playback, so nothing should happen. Nothing happens on my device either, the movie is skipped. @Wizzlewiz When the black screen appears, do you see a set of buttons at the side before it crashes? And your firmware might be a problem, I’ve only tested this onscripter binary with OS4.0… Anyone else have 3.1.2 here? No, it doesn’t have the set of buttons before it crashes. I’m going to try wiping and updating to 4.0, that way I can get a clean start. I have a feeling one of the many things I’ve installed are interfering. I’ll update after I am done. Before you update try doing what I told Kryger to do, chmod’ing the entire Umineko.app folder all to 755.
how to extract 0.txt from nscript.dat using nscdec ? crashes back to Springboard when I try to start it. any one have any idea what I am doing wrong here? Yes, someone else who has commented here also managed to get EP6 to work. Unless I missed something your configuration looks very correct. Before it crashes, do you see a set of buttons on the side? If you don’t, you can try going into my old Tsukihime tutorial and try using some of the commands on there (ldid etc). so it looks liek on mine at least you need to disable or fake sign some apps to launch which is weird. one thing is that the backgrounds and chracter portraits are too large (in demensions) and overlap the screen. Must be because of a different jailbreak. The 0.txt resulting from nscript.dat makes no sense. Linux may be the difference I don’t know. Here is what the text file looks like as a result. I need to change the filenames so they work, yet I cannot even discern the Japanese writing here. Anyway I was wondering if some kind person would upload their non-stupid 0.txt, or explain some way to get around this other than renaming all the japanese titles randomly/identically in the txt file (counting unidentified characters is no good also). P.S. You rock Oneoc! This takes some kind of awesomeness to create. This should correctly display all japanese characters. It seems it does not work on 4.1. It is jailbroken with limera1n, but no good. When I press on the icon it kinda half zooms in, then nothing. When I try again it does nothing. I cant do that idid thing either because the terminal also crashes before it even finishes loading. Anything else would be helpful, but it may be pointless. Thanks anyway Oneoc! I upgraded to 4.1 yesterday and jailbroke it with limera1n and it still worked for me. I didn’t have to do a ldid either… Well if you want to try, you can install openssh from cydia and then ssh into your phone if your MobileTerminal doesn’t work. well, it loaded anyway, now its showing some english in the menus but not always. The start button has an english description (cursive writing) for example, but the actual game is in Japanese. I dont know quite what to make of that. That is very weird… If the actual lines of text are japanese then that means your 0.txt (or nscript.dat) is either wrong or screwed up somewhere. Can you double check everything again? I’ve got it running on an iPhone 4 with 4.1 and it’s doing just fine. Sidenote: what should I put in to convert the files for retina display? Sorry but I don’t think that is possible. 1. Piracy – Putting this VN up onto a repo would mean making the entire game illegally available for download. Narcissu was originally a free VN, so there was probably no problem with that. 2. I’m not the owner of that repo, and I have not spoken with the owner in a while. 3. Size – The size of the package would be quite big, so the amount of bandwidth required would be quite a lot. 2) When I launch the game and load from a save, the music refuses to play. It will actually play for a very short moment and stop, and there’s no way I have found to get it to play again. If I keep playing in silence, the music will start normally whenever it’s scripted to change, but only when the track changes. Any advice? 1) Yes, tested games include Tsukihime, Narcissu, and Saya no Uta (I didn’t test this one, but someone else from a while back said that it worked). Either grab the onscripter binary from the package I included in this tutorial or a different one from my previous posts. You will have to edit SDLAppParam.plist and Info.plist and replace the path/game name. 2) Probably something wrong with the compiled onscripter binary. I’ll look into it. and btw are you working on porting some others visual novel ? As I mentioned before I have not personally tried it (another has said that it worked), but you would have to convert your Saya no Uta to PONScripter. I believe that there is a group out there that has made a “patch” for it to convert the game. Google it. And I can only port games that are onscripter compatible at the moment. Have you attempted to put “Fate Stay Night” on the ipod touch? Has it worked? I have not attempted it, however since it uses a different engine it would be very hard. anyone know what the buttons on the right actually do? Yep it’s the .nsa archives that you do not want to replace. As for nsaconv, it is a commandline tool. Open it up from command prompt/Terminal. Hey just wondering, do you think you would have to edit a lot to make Ep7 work? I mean it’s still not fully translated(%60 actually) but when the translation comes out do you think your going to make it work on the Ipod? There shouldn’t be any problems. In which ways did you try and get the OP’s working? It just seems a little odd that it couldn’t work. Do you think the iPod just doesn’t like the video format? Oh yes i forgot something, after you replace the text for the BGM in the “0.txt” folder, are you supposed to put it back into nscript.dat? Because at this moment i wouldn’t know how to do that. How about Fate Stay Night? Any luck with that? Fate/Stay Night runs on KiriKiri. ie. No. I managed to make it run at least with japanese text. Haven’t played it through yet though. I’m trying to use the mirror moon translation. Are the missing animations a big deal? Should I try to just play it on my DS instead? in my opinion they aren’t such a big deal. the game certainly can be enjoyed without most of those animations. (the one’s missing are stuff like the clock, the rain, and the swirling effects, I think most others work). Mmm The rain was working on mine, also there is one scene in Ep2 seems to crash directly after Kyrie is talking to “Beatrice” in the chapel. I believe it showed each person sprite at that time. Ether way, it could easily be skipped over without any problems. What is the name of the bgm track that plays in that scene? It’s probably the music, can you check the name of the track that plays at that stage? The reason it doesn’t work is because it references “80” when Jessica smiles. That file doesn’t exist in my folders?… So I changed it to “Answer.ogg” which I know exists, and it made the game continue. Music didn’t change, but the error went away! While that file didn’t exist it wasn’t the problem. The real problem was when translating someone typo’d and put a bracket instead of a semicolon when making the original text a comment. Look for the following and replace the bracket on the first japanese line to a semicolon and the game will continue. Thanks for the guide, and I managed to get it running. The only problem I’m having is that the game crashes every time I try to save. I was wondering if you have any idea how to fix this? Did you chmod the entire folder (recursively) “/User/Media/ons/Umineko” to 777? I redid the process and it works fine this time. I may have done something wrong but the only thing I remember doing differently is using i-FunBox rather than WinSCP. Either way thanks for the guide, now I can get to reading! I wanted to say, for the one I’m working on at least, that the BGM オルガン小曲_第6億番_ハ短調 wasn’t playing. It’s not like it crashes it just won’t play, but changing the file name and then the 0.txt fixed it like usual. The reason I got Umineko on the ipod for my friend so I can’t view the Music Box yet. I was wondering if when on the Music Box will it show the file as BGM1, BGM2, ect? Just curious. Since I’m rather picky with this sort of thing I’ll probably put in the English translation for the songs if it doesn’t work. I have a question about using this for other games. Do the games have to be organized specifically for this to work or should they be fine the way they are initially. I’m asking because after converting Saya No Uta to the POnscriper I still don’t see any .nsa or nscript.dat files that were in the Umineko guide. I’m not sure if I’m supposed to pack each image folder into an .nsa and convert it or if I’m supposed to unpack it again after I do that. Or does something more complicated have to be done such as programming. I’d be wasting my time in that case. Well looking at the PSP port I’m guessing all the folders inside the root should be in one arc.nsa. I did that and now at least the buttons appear before the game crashes. I’ve never attempted to convert Saya no Uta to PONscripter, but from one of the comments a while ago someone else was successful in making it run on the iPhone. If there isn’t a nscript.dat file then is there perhaps a 0.txt file (or something similar that contains all the script data)? Get Notepad++, it lets you choose the encoding once you open the file, allowing the characters to be displayed correctly. I might upload a changed 0.txt later. I’ve cd’d my way into the nsaconv folder and I attempt to run it. That’s what happens when I try and run, though I don’t quite understand where the new file is supposed to get saved. I’ve ran searches and I concluded that its not converting properly since no new files with the names arc.nsa or arc9000.nsa have been made. From what I can tell even though I have very little to no idea how this program works, its telling me that there’s something incorrect in the way I use it. So if you can, please spot the error for me. If you need any further information I’ll be more than willing to provide it. You need to have your path to your source arc.nsa in double quotes (“C:\Program Files\7th_Expansion\Umineko\arc.nsa”). This is because there is a space in between the folder name “Program Files”. To simplify it even further I put it directly into C:\Umineko , and that indeed solved the problem. My thanks for the quick and accurate reply. And one more question before I get this show on the road. At step 7, I’ve generally understood what it means to CHMOD but I’ve yet to find an exact guide on how to do it. If you could redirect me to one or just tell me exactly what to look for, that would be greatly appreciated. Because all I’ve learned is that I need to mod the permissions on the folders and make it the right numbers (777 and 775). Though I still don’t understand, do I do this on the PC, or download an app and do it on my Iphone? That is it, I got it working, music is fine, resolution is perfect, no problems what so ever. This worked on both an iPhone 2G 3.1.2 AND 3.1.3 redsn0w and sn0wbreeze JB. If anyone has an iPhone 2G with the same JB, I’ll fix any problem you have, because hot damn I went through hell these last 2 days just to get this game working, spent 2 nights up untill 5AM to get it working and I have triumphed. If you have any questions relating specifically to running this on a 2G with 3.1.2/3 just contact me at chillybones@live.com and I’ll try my best to help you out. Also thank you Oneoc for this amazing tutorial, hope you keep up the good work. I took that picture and completed the episode on the PC so this isn’t too big a deal but I’m not sure if you’d know why this happens? I’m fairly certain I chmod’d everything through ssh, and I fixed the music issue addressed earlier when I also ran into the same app bootout in Episode 2 with Kyrie & Beatrice. Not sure if it’s just a script typo, but it freezes like that every time I’ve tried. As an additional sidenote, I tried using this tutorial with Episode 8 and it mixed with Episode 7’s english patch and it seems to work excellently. I’ll have a look at those later when I have time. Hey 0neoc, do you mind making a tutorial to import any Onscripter visual novel to iPhone in general? I read before that it can be done. I’ll make a new post for this soon. Its wonderful to come upon this! I recently got the VN 1 – 4 and i was trying to follow this tutorial the other day, but, im not all that techy so i got stuck with the onscripter tool part using the nsaconv. I would double click it, it would open up for a split second then close up. Restarted my computer and stuff, and still keeps doing the same thing )= Can anyone help me out? I’m probably doing something wrong, or my computer is being retarded. The path specified between the double quotes should be where the nsaconv.exe file is located (and where you want the converted nsa files to appear). replace path_to/Umineko/arc.nsa with the real path to it. You can then convert the other .nsa files with this method. For “percentage resize:” choose 66%. Thank you very much! took me like 3 hours after that step to get everything else working properly .-. had to update mobile terminal and stuff. Only problem i see is what some are having where theres no music when you load up a save file untill you get to a point that starts up another song. Other then that, its great! Thank you! It should work if you use the EP 7 files instead of 1-4 even if you keep the folder name “Umineko.app”. i actually think that im going to wait for the translation of episode 8 to be finished and then put that on my iphone. i really can’t wait to see how this franchise finishes. Thanks for this guide. I’ve followed all the instructions in an attempt to install Umineko (ep 1-4) on my iPad and I can make it to the main menu (with sound effects and everything) except that the game then crashes back to the springboard as soon as I try to start a new game or if I try to unlock episode 2-4. Do you have any idea why this might be happening? Could it be having trouble writing to the gloval.sav file? Where does the version of onscripter included here normally create its saves? Actually, it’s not that because I managed to get Narcissu working fine (including saving) using the same exact executable. And if I delete one of the arc files so that the “You haven’t installed this game properly” message comes up, it actually does create a gloval.sav… but it still crashes every time I try to play it properly. I am perplexed. iPad 1 running iOS 4.3.2 by the way, redsn0w jailbreak. Often these crashes are a result of not having the correct file/folder permissions. If in doubt chmod all files and folders recursively to 777 and see what happens. Thanks for the reply! Yeah, I’ve chmodded the entire ons/ directory and the Umineko.app directory to 777, no luck yet (crashes in the same place). Wondering if it might be either a 4.3.2 thing or an iPad thing, but I don’t have any other devices to compare with. Do you see something like a stderr.txt? command [mode_wave_demo] is not supported yet!! command [language] is not supported yet!! command [errorsave] is not supported yet!! command [addkinsoku] is not supported yet!! command [menu_click_def] is not supported yet!! command [menu_waveon] is not supported yet!! I figure most of those are normal, not sure about the memory warning though. Did you get umineko to work? I seem to be crashing at the same place… I get the menu just fine but when I start a new game it crashes. I can’t seem to get saving to work. The game runs properly, and I can read it, but I can’t save (Or read previous saves from the computer). I have set everything in the Umineko folders to 777. Oh, I must also mention that I get black lines when characters appear. The black lines are unfortunately normal. As for saving unfortunately I cannot think of any reasons right now. Chmod’ing everything fixed it for me. Info.plist and SDLAppParam.plist, are located in the Umineko.app folder, found in the download provided in the original post. I know that would be considered illigal but could someone please be so kind to upload it? Is there a chance that there’s something wrong with my files? Do you know if its beacaus of my iPod or my Firmware? If its the firmware do you happen to know up to which it works? aye i am having real trouble with this… i read your tutorial and everything but yet I am still unable to make it work.. hmmm maybe it’s just me. I dunno if this is happening to anyone else, but after following the instructions on a jailbroken 4.3, the app will open and go as far as the main menu, but trying to play ep1 or remove a lock fails. Anyone else have this problem? Yep, I had the same issue earlier this year. I tried a bunch of things (including chmod-777ing the entire directory and just about everything else I could find that looked at all relevant) but never figured out what the problem was or how to fix it. Has anyone managed to get this working on iOS 5.0.1? i wish for enjoyment, for the reason that this this site conations really fastidious funny material too. Like many others when I click the icon it starts up but immediately closes again. I’ve double checked permissions and they’re right. I’ve done the ldid thing in mobileterminal (but when I tried sysctl I couldnt do it due to them being read only). I tried running the exe in the umineko folder on my ipad and that works just fine. I can’t find the stderr.txt. Where is it supposed to turn up? I got a bit longer now. I found a newer onscripter binary which I changed to. Now the game starts, I see the menu but when I start a new game it crashes in the first scene. And another question. Is it possible to make it fit on the whole iPad screen instead of appearing as an iPhone app? Anyone who knows how to put the files onto a Ipad 3 since (from what I could find) you can’t access the file system? I have downloaded iFile from Cydia but couldn’t find a way to transfer the files from the computer. Hello there, You have performed an excellent job. I will certainly digg it and individually suggest to my friends.